My book Romance and Other Stories is now available at The Write Deal online bookstore. From The Write Deal website: "Two young women decide to become prostitutes. A wife can no longer hide a secret from her husband. A daughter confronts her father’s manic depression. A pregnant teenager struggles to leave her reservation. An aspiring romance novelist meets a handsome stranger. In Samantha Prust’s ballsy, finely-crafted collection, characters often feel as if they have “dropped out of the clear blue sky and onto the flat prairie.” The worlds Prust creates are, like the northern hinterlands in which they are set, deceptively empty. Here, vulnerable young women on the edge of maturity walk a razor’s edge. We walk with them, drawn in by Prust’s sensuous and simple language, and by a mysterious, unresolved tension usually the purview of dreams. 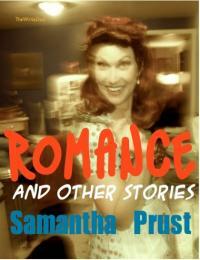 Samantha Prust was raised in South Dakota. She has an MFA in creative writing from Colorado State University. For over 15 years she has worked as an editor and writer in book and magazine publishing, and is the author of A Sentence a Day: Short, Playful Proofreading Exercises (Prufrock Press, 2007). She lives with her husband in Colorado, where she works as a freelance editor and writer." This entry was posted on Wednesday, December 28th, 2011 at 12:00 am	and is filed under Uncategorized. You can follow any responses to this entry through the RSS 2.0 feed. You can leave a response, or trackback from your own site. Thanks, everyone! I really appreciate the feedback and support. Thanks for taking the time to send your congrats, Helen!